Katherine Moennig (cousin) Gwyneth Kate Paltrow Martin ( /ˈɡwɪnɪθ ˈpæltroʊ/; ojoibi September 27, 1972) je osere ara Amerika. 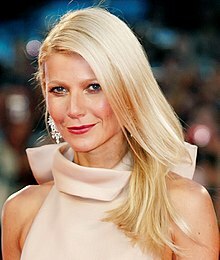 ↑ "Gwyneth Paltrow Profile". E! Online. Archived from the original on 2012-05-26. Retrieved 2007-09-17. Àtunṣe ojúewé yi gbẹ̀yìn wáyé ni ọjọ́ 13 Oṣù Kọkànlá 2013, ni ago 15:42.